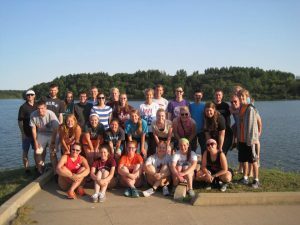 Studies, service projects, mission trips, social activities, and a relationship with the local Lutheran church, we seek to provide a Christian atmosphere for spiritual growth and development. Click here for information about all of the different aspects of LSF! LSF has no official ‘membership’ procedures, no initiation rites, and most certainly no fees or “required” time commitments. To be active within LSF is easy: simply act- get involved with any of the opportunities provided and get connected through fellowship and the study of God’s word. You make as much of a time commitment as you want. The best ways to start getting involved include attending one of the weekly small groups or coming to our praise service on campus (Te Deum). Participating in our social events and coming on the Spring Break Mission Trip are also great ways to form lasting friendships! So I guess the answer to the question above is really up to you. You decide what LSF will be for you. Loving God, loving others….serving God, serving others. That’s what LSF is all about! Do you have to be Lutheran to be in LSF? No. People of all backgrounds are welcome to participate in Lutheran Student Fellowship’s activities. We do have some fundraisers and events that we organize with Faith Lutheran Church, so feel free to attend whichever events you feel most comfortable. Generally around 30 people attend our events. Our weekly Bible Studies typically have between 10 and 15 people. Other events such as our annual Christmas Dinner bring in as many as 60 students or more. LSF is big enough to host major events but small enough that you can know everybody in the organization. How do you become a member of LSF? From our Constitution: “…all persons shall be considered members of LSF if they are regularly active in an LSF activity.” In plain English, this means that if you come to LSF events on a regular basis, you’re in! We would love to see your shining face at our monthly General Assembly Meetings, which are held on a designated Sunday around 6:30 (after dinner) at the Lutheran Campus Center. We’ll keep you informed through our website, fliers in the dorms, word of mouth, and, of course, email. We have a weekly email newsletter which lists upcoming events and announcements. Email lsftruman@gmail.com to be added to our mailing list! Does it cost anything to be in LSF? No. There are no dues, required fees, or contributions to be a member of LSF. However, some activities (such as the Sunday Night Dinners, Spring Break Trip, Weekend Retreats) do have a cost associated with it. If you want to participate in an activity and you cannot afford to go, we’d be more than happy to work with you! Am I required to attend any activities? Not at all. You can come to as much or as little as you choose. We encourage you to regularly attend one Bible Study each week, join us for the events, come to church on Sunday, or just stop by the house at anytime. We also encourage you to come to Te Deum! Te Deum is LSF’s on-campus musical prayer and praise service. It is held every Thursday at 8 P.M. while school is in session. You can find out more about Te Deum on our Ministry page. How long has LSF been around? 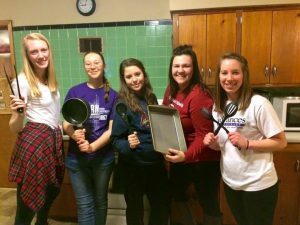 Lutheran Student Fellowship has been at Truman State University since 1980. Before that, it was known as the Lutheran Student Movement since the 70s. Where can I find out more about Faith Lutheran Church?